Why choose Embrace Financial Services? If you’ve recently bought a Fitbit you will undoubtedly be trying to achieve the recommended 10,000 steps a day to make sure that you get enough exercise to remain healthy. The market for these devices has grown expediently in the UK over the past couple of years, the research firm IDC have forecast that by 2019 more than 100 million would have been sold globally. However according to some news studies they say that achieving your 10,000 steps per day doesn’t significantly improve your health. Even if this is true, some exercise must be better than no exercise, and getting out into nature or visiting a beautiful park is not only good for the body it’s also good for the mind. If you've always dreamed of being near a beautiful park, here is one beautiful property on the market next to Great Notely park. 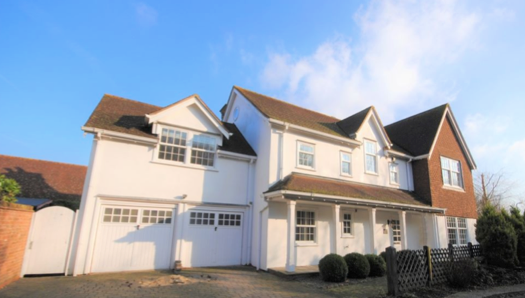 This six bedroom house in Great Notley, Braintree is right next to the stunning Notley Park. The park with its 100 acres offers plenty of space to relax or for kids to enjoy Essex’s Longest play trail – 1.2km long, it has a giant see-saw, climbing forest, tyre swings, sand pits, rope climbers, slides, forts and a water play area – a great place for any age to enjoy. Located in the highly sought after Hunters Lodge area of Great Notley Garden Village, this six bedroom New England style executive property offers over 3,300 sq ft. of superb family accommodation generously set out over three floors. The integrated QED sound system means you can have a choice of music throughout the house and Internally the property is a delight with a fabulous Kitchen/Family room with shaker style Kitchen with built in Range Cooker and appliances with a grand inglenook style fireplace creating a wonderful feature of the room. The master suite, with its vaulted ceiling, is sumptuous with a dressing area and spacious four piece en-suite with roll top bath. With a double garage, parking and falling within the catchment of the highly regarded Notley High School this property is an absolute must view. Guide Price £730,000. For more information or to arrange a viewing please follow this link or call our team on Intercounty Braintree 01376 328288. 3 bedroom Terraced House for sale, Sawbridgeworth, Hertfordshire. 3 bedroom Semi Detached House for sale, Saffron Walden, Essex, CB10. So your house is now on the market - how do you maximise your property visits? How to plan your Spring garden…. Intercounty is a trading name of ICIEA Limited Company No. 4842186 whose registered office is at 2nd Floor Gateway 2, Holgate Park Drive, York, YO26 4GB. ICIEA Limited is a subsidiary of LSL Property Services plc. Mortgage and protection advice is provided by Embrace Financial Services Ltd., an Appointed Representative of PRIMIS Mortgage Network (PRIMIS) a trading name of First Complete Limited which is authorised and regulated by the Financial Conduct Authority for mortgages, protection insurance and general insurance products only. Any other product or service offered by Intercounty may not be the responsibility of PRIMIS and may also not be subject to regulation by the Financial Conduct Authority. ICIEA Ltd trading as Intercounty is an Introducer Appointed Representative of PRIMIS. We are members of The Property Ombudsman (TPO), there to protect your interests. We abide by the TPO code of conduct.